CB Fashion, service provider specialized in fashion, footwear and lifestyle logistics is expanding its current service portfolio in cooperation with Mieloo & Alexander. Fashion brands like NA-KD, America Today, Sarah Pacini, Suitsupply, Cavallaro, Olsen Mode, Micro Fashion and many others have established a long term relationship with CB Fashion. To not only ensure its leading position in the industry, but also to be equipped for the future, the company teams up with Mieloo & Alexander. 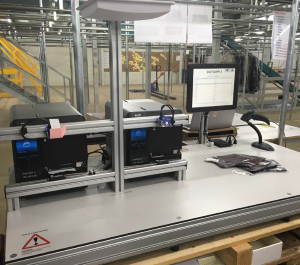 To be able to support its clients with the roll-out of UHF RFID technology, CB Fashion engaged Mieloo & Alexander RFID Integrators to design and build RFID solutions for its fashion & apparel warehouse and logistics operations. 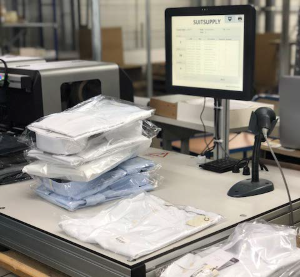 The 1st phase of the RFID deployment focusses on enabling CB Fashion to guarantee its RFID customers, that all shipments to their RFID stores are 100% correctly tagged. This is fundamental to achieving close to 100% stock accuracy in the store. CB Fashion uses Mieloo & Alexander’s RFID packing table to check Flat Pack cartons, and M&A’s RFID tunnel to check Goods on Hanger. Both solutions report tagging or picking errors to an operator who resolves them efficiently, after which the RFID EPC codes in each carton or bundle are updated in CB Fashion’s WMS, which is now also RFID enabled. The EPC codes are also included in the dispatch advice that is passed on to the client’s systems, so that the EPC’s become available in the store, which is essential for RFID enabled goods receiving and inventory accuracy: “A simple RFID scan with a handheld or fixed reader in the store is now sufficient to receive the entire delivery. Time that used to be spend on manual receiving and checks, counting, posting or tagging, can now be spent on helping the customers” says Lisanne Bertens – Logistics Engineer CB Fashion. Pim van Rooij – Key Account Manager at CB Fashion: “we selected Mieloo & Alexander because of their extensive knowledge of logistics operations and proven track record in delivering the latest technology to achieve operational excellence”. Clearly, CB Fashion’s 1st objective is to incorporate the capability to support its clients with their RFID initiatives. But in the future, the company will also be able to improve other logistics processes like receiving, item picking and shelf location counting with RFID technology. We look forward to supporting the team at CB Fashion taking also these steps forward! Sander Merkx, Director Mieloo & Alexander.